I created a steam table calculator which makes it easy to calculate the thermodynamic properties of water in the subcooled, saturated, and superheated region. This calculator is programmed in Microsoft Excel. The calculator uses data points from thermodynamic property tables, and uses linear interpolation to calculate the following six thermodynamic properties: Temperature (T), pressure (P), specific volume (v), energy (u), enthalpy (h), and entropy (s). The Excel spreadsheet calculates thermodynamic properties in the superheated region for an absolute pressure range of 0.01-80 MPa, using 30 data tables spread apart over this pressure range. It calculates thermodynamic properties in the subcooled region for an absolute pressure range of 5-50 MPa, using 7 data tables spread apart over this range. In the saturated region, you can specify any of the six thermodynamic properties and automatically solve for the remaining five. In the subcooled and superheated region, you can specify (P, T), (P, v), (P, u), (P, h), or (P, s), and automatically solve for the remaining thermodynamic properties. All the files that come with this calculator are contained in a single (compressed) file, in the "zip" format. You need to uncompress this file before you can access the calculator. It's available through this link. To use the calculator you need to have Microsoft Excel installed on your computer. The program is compatible with all versions of Excel. 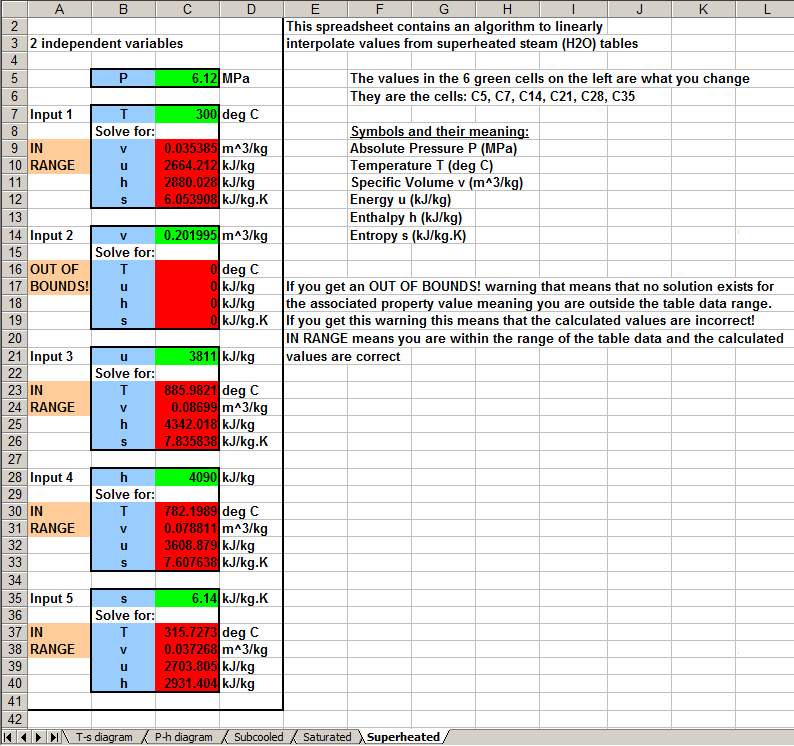 Click on this link to see a screen capture of the Excel spreadsheet for the superheated region. Note that the Excel program uses SI units for the thermodynamic property values.